Newly Engaged in Politics, Anxious for 2018? | Econsult Solutions, Inc. Newly Engaged in Politics, Anxious for 2018? The 2016 Presidential Election is little more than a month removed, and many Philadelphians are feeling newly engaged in politics with an eye towards the 2018 and 2020 elections. Well, did you know that residents have an important election in just five months? A Municipal Primary will be held in Philadelphia on May 16, 2017. On that day, residents will vote for the City Controller, District Attorney, and Judges of Common Pleas, Municipal Court, Superior Court, and Traffic Court. Municipal mid-term primaries are notorious sleepers for two reasons that are rather disheartening when taken together. First, Philadelphia being a Democratic Party bastion, the results of the primary essentially decide who will take office. Secondly, voter turnout is historically low, especially when it is not also a mayoral primary. These primaries occur in odd years, so they don’t align with presidential or senatorial election cycles. 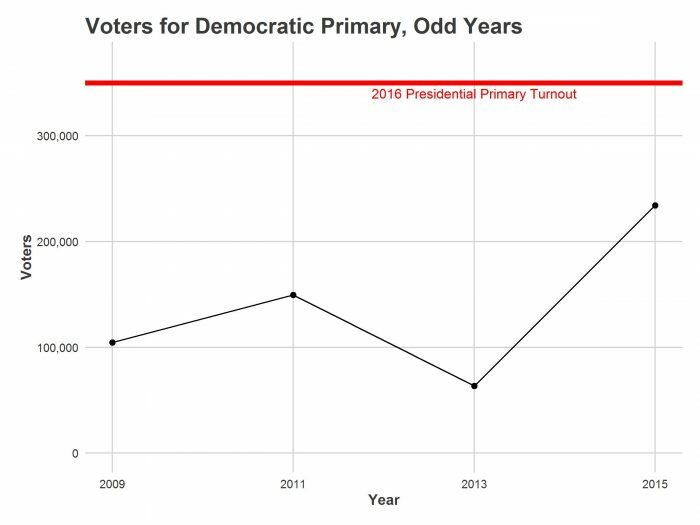 For instance, the 2013 primary had less than one third of the turnout of the 2016 primary. So we have a decisive election in which few vote. These odd-year primaries should be of concern to Philadelphians. Particularly interesting to observe is the election of Court of Common Pleas judges. The city’s Court of Common Pleas is responsible for major civil and criminal trials, juvenile and domestic relations, and orphans. Judges are elected to 10-year terms, and those terms are renewed on a separate retention ballot—so incumbents are not explicitly running against other candidates. Voters are asked to fill a number of spots in a given year depending on court vacancies — six in 2013, twelve in 2015 — and select from a huge number of candidates — 24 in 2013, 43 in 2015. This system — with low voter attention and many candidates to track — demands a lot of even the most diligent voter. To illustrate, below is the Democratic candidate portion of the Judge of the Court of Common Pleas Sample Ballot for the 2015 Primary. Maybe we can expect voters to know their top two picks, but how likely is it that a voter has a well-informed distinction between their 12th and 13th top choice? Just how much does ballot position matter? Let’s dig into the numbers. First, total turnout in municipal elections is low. To model how ballot position affects elections, I have used Ward/Division election results for the 2009, 2011, 2013, and 2015 primaries from the (awesome) Philadelphia City Commissioners website. I don’t have individual voter records, so I have calculated the total votes for judges but not voters, as voters can, but don’t necessarily have to vote for multiple candidates. Instead, I have guessed at the number of voters in the Democratic primary by calculating the total votes for the office with the highest turnout, and in which voters can choose only one candidate (in 2011 and 2015, this was the mayoral race, for example). This won’t perfectly match the Court of Common of Common Pleas elections, as many people who vote for mayor will leave their ballot for Common Pleas judges entirely blank, but it captures the broader pattern. Turnout in non-mayoral cycles — as in 2009 and 2013 — is very low; less than half of the turnout for the competitive 2015 race for mayor. For reference, 350,000 Philadelphians voted in the 2016 Democratic Presidential Primary. The year 2017 will be another non-mayoral, non-presidential race – expect low turnout. What determines who wins in the Court of Common Pleas election? For these analyses, I have used the total votes rather than the total voters. This means, for example, that in 2015, when voters were allowed to choose up to 12 candidates, there could be 12 times as many votes as voters. A candidate who received the vote of every voter would win only 8.3% of the vote if every voter voted for 11 other candidates as well. This isn’t more than an accounting trick, but it means that the numbers may look low; for example in 2015, Stephanie Sawyer was the twelfth judge to win with a mere 2.9% of the vote. So, how much does ballot position effect votes? A lot. Figure 2 shows the average percentage of the vote for each ballot position from 2009 to 2015. The very first candidate received 6.5% of the vote, and won in every election. Everyone listed in the first column did well, as did many in the second column. 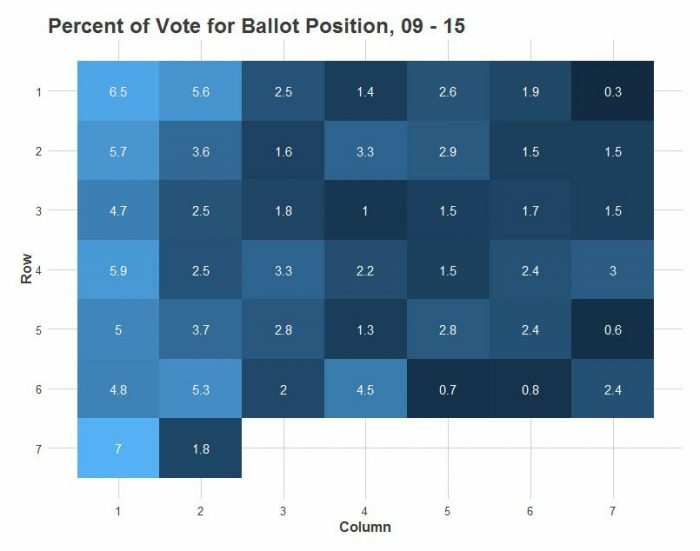 By contrast, no single ballot position in columns 3-7 received as many votes on average as any position in the first column. This is about as close to causal as we get in social science since the ballot positions are randomly assigned. That is, we can confidently state that the ballot position lottery causes the higher numbers of votes. But, by what pathway does it do so? The obvious answer is that voters in the booth only push buttons in the first column. However there are other mediating pathways that could be exacerbating the pattern. It could be that endorsers (e.g. : the Democratic Committee, the Philadelphia Inquirer) use ballot position to inform their endorsements – wanting to back the winning horse, or at least not squander their endorsement on the sixth column candidate who doesn’t have a shot. In 2015, repeatedly censured top ballot position winner Scott DiClaudio had the Democratic Committee endorsement. Often, the foretelling ballot position becomes a self-fulfilling prophecy. Candidates who receive a poor ballot position in the draw decide to not waste time and money campaigning, instead waiting to test their luck two years later. To Endorse or Not to Endorse, Does it Really Matter? To assess the relative effects of ballot position and endorsements I turn to regression analysis of the four elections’ results using a Poisson regression. In doing so I estimate the total votes received by a candidate based on their ballot position, endorsements received, and whether they were on the Republican ballot too ,including year-fixed effects, which is a method to account for differences across years in turnout, the number of candidates on the ballot, and the number of candidates to select . Three endorsements are included in this analysis. First, the Democratic Committee endorsements, which is the dominant political party, though individual Ward leaders often make their own endorsements (more on this in a future post). Endorsements from the Philadelphia Inquirer are included, as well as from the Philadelphia Bar Association Commission. The Bar Association’s endorsement is often cited as a non-partisan measure of legal quality, and in fact, in recent years the Inquirer has simply cited the Bar Association’s endorsements as their own. Figure 3 calculates the marginal effect of each feature on a baseline 2013 candidate who begins with none of them – a candidate in column and row 3-7 with no endorsements. The 2017 election is likely to be more comparable to 2013 than to 2015 in terms of turnout, so 2013 represents a better prediction of 2017 effects. To interpret the results, a candidate with none of these features begins at 1.5% of the vote. Each of the features would independently add the labeled percentage points. The lines are 95% confidence intervals. Being in the very first ballot position more than doubles a candidate’s votes (x2.4), bringing a 2.2 percentage point gain to that baseline candidate. Other candidates in the first column still receive a 2.0 percentage point boost. Recall that in 2013, it only took 6.5% of the vote to win. Candidates in the second column receive a boost of 0.9 percentage points, still more valuable than an Inquirer endorsement (0.7). Interestingly, being in the first row, except for that very first spot, doesn’t appear to be important. The Democratic Committee endorsement fares well, giving candidates a 1.4 percentage point boost. A recommendation from the Philadelphia Bar Association Commission appears to be worth a trivial 0.2 percentage points, except for one big caveat, in 2013 and 2015, the Inquirer simply echoed the Commission’s endorsements. 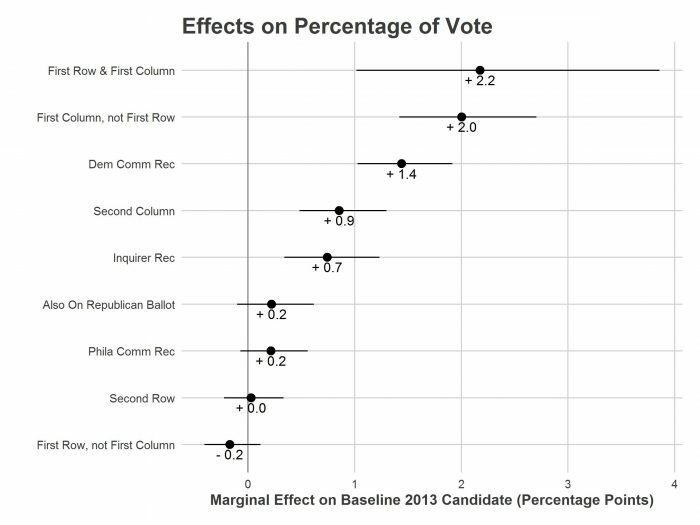 The regression results here state that the committee has no effect when it disagrees with the Inquirer or the Democratic Committee, but to the extent that the Philadelphia Commission’s endorsements inform the Inquirer’s and Democratic Committee’s endorsements, that effect isn’t captured here. This regression also doesn’t have other traits that could be important, such as time and money spent campaigning. 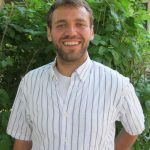 These could very well be correlated to endorsements; richer candidates could better afford the Democratic Committee fees for endorsement, which would mean that we are overstating the effect of a Democratic endorsement by conflating it with the effect of other ways to spend money and energy. That would just mean, of course, that the role of ballot position is even more important relative to endorsements than it looks here. I will further explore election processes in upcoming issues of ESI’s Present Value. However, the point here is worth repeating – the largest factor in deciding who is chosen to be Philadelphia’s judges is an entirely random lottery. We have a system in which the luck of being randomly picked is worth as much as the endorsements of the city’s dominant political party and the city’s most influential newspaper combined. A few candidates are listed on both the Democratic and Republican primary ballot. I have only considered votes on the Democratic Ballot, but one could imagine voters take the presence of the candidate on the other ballot as a sign, positive or negative. I fit a robust linear regression, using as the response variable the log of the percent of the vote. This performs better than a regression on the non-transformed percent of the vote because different years have such different baselines; due to differences in the number of candidates, 3% of the vote may win in one year while 7% wins in another. The log specification models multiplicative effects, rather than additive. A non-transformed linear regression provides the same qualitative results. This post has been revised to reflect the following modification: An earlier version of this post stated that the way Philadelphia’s judges are picked is by having their names randomly pulled out of a coffee can in Philadelphia City Hall. 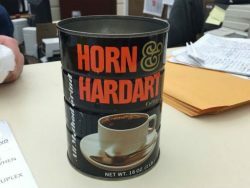 In reality, unlike other Philadelphia primary lotteries, the Court of Common Pleas lottery occurs in Harrisburg, and not in City Hall from the Horn and Hardart coffee can. The process is still a random lottery though.